The athletic therapist for the Regina Pats may have played a significant part in the teams' success on a four game BC Division road trip. Greg Mayer take a bow. Mayer, who was raised in Kelowna, was the architect in scheduling the trip and made sure the players had sufficient time to recover between games. It is not a perfect formula but the strategic planning appeared to pay off. At Prospera Place Saturday night, the Pats looked rested/fresh in an impressive 3-1 win over the startled Kelowna Rockets. The Pats looked like a team opening a four game home stand while the Rockets appeared to be playing the final game of a road trip that saw them visit Vancouver, Victoria, Prince George and Kamloops. Unfortunately the roles were reversed. The Pats hustled, executed and were full marks in handing the Rockets their third regulation loss of the season and extended the WHL's top teams' losing streak on home ice to three games. (0-2-1-0). The Pats ended the trip 3-1-0-0. Digging deeper into Mayer's contribution to the Pats success; I was told he was at league scheduling meetings this summer because the Pats ownership group was still getting its ducks in a row in finding a coach after firing Malcolm Cameron and eventually replacing him with John Paddock. Mayer looked at the BC Division road trip and made sure his team had a chance at success by strategically scheduling the games so the Pats players had optimum rest. The trip started in Vancouver before playing in Victoria, Prince George, Kamloops and then ending in Kelowna. The mid-week portion of the trip is where the Pats recharged the batteries. After back-to-back games against the Giants and Royals, the team had three days off before playing Prince George. It was followed by another day off to close out the trip against Kamloops and Kelowna on back-to-back nights. That three day rest between games, essentially halfway through the trip, may have played a significant part in how fresh the Pats looked on the ice. Road weary they were not. They looked excited to play. Ok, enough about Mayer. You can schedule the games anyway you want, but the players still have to execute and that's exactly what the Pats did. They were first on pucks, hustled all night long and were the better team on this night. I thought Rockets goaltender Jackson Whistle had an extremely strong game - again - and was the reason the score ended up 3-1. Whistle was named a game star on our broadcast considering he was the most consistent player on the ice for the home team. Whistle's best stop came when he took a shot flush off the mask in the second period that would have dropped most goalies to their knees. While Whistle was solid for the Rockets, Pats goaltender Daniel Wapple was equally as good at the other end of the ice. Wapple's best save came against Rockets forward Nick Merkley when he was allowed to skate untouched towards the net before putting a back hand shot on goal that Wapple turned aside. The save came with under two minutes left in the game and with the Pats clinging to a 2-1 lead. Wapple didn't make as many tough saves as Whistle did, but on our broadcast he too received a star for his steady influence throughout the game. How good was Morgan Klimchuk? Yikes. The first round pick of the NHL's Calgary Flames is the real deal. The 19 year-old has amazing quickness and his desire to win pucks and track back were noticeable. While he put up impressive numbers last season as an 18 year-old, I honestly didn't notice him much when the Rockets payed a visit to Regina last December. In that one time showing, Klimchuk was a non-factor. Last night in Kelowna, the Calgary resident looked like he should wear Canadian colours at Christmas time at the World Junior Hockey Championships. It was a tough night for the Rockets on so many levels. The passing was consistently off the mark. Even 6 foot passes were either in the skates or behind an awaiting teammate. Everyone looked out of sync outside of Whistle. No hitting. I saw little in the way of contact made by the home team. It made for an easy game for the Pats. Rourke Chartier picked up his 29th goal of the season in the setback. The 18 year-old scored 18 goals in November. Some players don't score than many goals in a season. Hello Team Canada World Junior team invite!! Nick Merkley had his 12 game point streak snapped. Merkley had 4+17=21 over that stretch. It was the longest point streak of his career and the third longest in Kelowna Rockets franchise history. The win snapped a 6 game losing streak for the Pats against the Rockets. It was Regina's first win in Kelowna since 2006. The Rockets now prepare for a home game against the Saskatoon Blades Wednesday night. Like the Pats, the Blades will save their best for the mid-week tilt. Tonight’s Preview: The Kelowna Rockets open a four game home stand tonight against the visiting Regina Pats. The Rockets host Saskatoon Wednesday, Prince George Friday and Prince Albert Saturday night. Yes, three of the Rockets’ next four games are against teams in the Eastern Division. This is the one and only meeting of the season between the two. Last season in Regina, Myles Bell scored the game winning goal in overtime lifting the Rockets to a 5-4 win (December 14/2013). In the Pats last appearance at Prospera Place, November 23, 2012, J.T Barnett scored twice in a Rockets 5-1 win. In fact, the Rockets have won 6 straight games against the Pats. The last time Regina earned a win against the defending Western Hockey League regular season champions was December 9, 2007 when the Pats were a 4-3 winner at the then named Agridome. The last Pats win in Kelowna was November 24th, 2006 in a 3-1 victory. Logan Pyett scored the game winning goal. Chris Ray scored the lone goal for the home team while Kristofer Westblom suffered the loss in goal. The Rockets are one of only two teams in the WHL with one regulation loss on home ice. At 9-1-1-0, only Brandon has an equally impressive home record at 10-2-2-0. The Rockets are coming off a 4-1 win in Tri City Wednesday night. The ended a portion of the schedule where the team played 9 of 14 games on the road. Rourke Roll’n: How good has Rourke Chartier been in the month of November? Are 17 goals good enough for ya? The 18 year-old has 17+10=27 and is almost a shoe-in for the WHL November Player of the Month. Chartier’s 28 goals have been scored 17 games. The 18 year-old has been held goal-less 9 times this season. The Rockets had two 30+ goal scorers last season. Myles Bell had 42 while Ryan Olsen found the back of the net 30 times. By comparison, Bell scored his 30th goal in his 52nd game. Jamie Benn, in 2008-2009, scored 30 goals in 36 games. World Junior Bound: Congratulations to 18 year-old Kelowna Rockets forward Kris Schmidli, who will participate in the upcoming World Junior Hockey Champions for Switzerland. The Rockets first pick in the CHL European draft two years ago has 5 goals and 12 assists which is good for 17 points in only his second season in the WHL. Let’s go streaking: Nick Merkley is riding a 12 game point streak (4+17=21) heading into tonight’s game. Here are the longest point streaks by a Rockets player over the years. Milestones: Tyson Baillie is 5 assists shy of 100 for his career…Nick Merkley and Kris Schmidli are 6 games shy of 100 for their careers…Riley Stadel is 9 games shy of 150 for his career…Madison Bowey is 7 assists shy of 100 for his career. Who’s Hot: Jesse Lees has points in 6 of his last 8 games. Lees has 4+7=11 over that period…Tyson Baillie has six goals in his last 7 games and has points in 8 of his last 10…Over that period, the 19 year-old has (8+6=14)...Rourke Chartier has four more goals (28) than he had all of last season. Chartier has goals in 13 of his last 15 games….Nick Merkley has 4+16=20 in his last 12 games…Madison Bowey has been held off the score-sheet 7 times this season. Chartier forcing Hockey Canada's hand? Is Rourke Chartier literally forcing Hockey Canada's hand into inviting the 18 year-old to next months main camp in Ontario? Chartier's 28 goals, the most of any player in the Canadian Hockey league, can't be overlooked. It isn't like the Saskatoon resident is off Hockey Canada's radar all together though. The soft spoken forward was a member of Team Canada that competed at the Ivan Hlicka tournament. Chartier's hot stick couldn't be denied Wednesday night in the Rockets 4-1 win in Tri City, snapping a modest two game losing streak. Chartier now has 17 goals this month and has six-two goal games in November. Did I expect Chartier to have this much success? No! I thought he would eventually score 30 goals in the WHL, but to be knocking on that benchmark with less than half a season played is remarkable. Chartier's career high 24 goals - set last year - will be smashed this season. What is safe is the 86 goals he scored playing bantam hockey with the Saskatoon Outlaws in 2009-2010. I thought it was a textbook road game by the Rockets Wednesday night. Despite missing several great chances to score in the first period thanks to three power plays, the visitors didn't get rattled. Instead they just stayed the course and eventually blew the game open with a three goal third period. I thought the Rockets were especially clean in their own zone. The only breakdown wasn't really a breakdown when Parker Bowles came out of the penalty box and skated all alone on a breakaway before being denied by the right pad of goaltender Jackson Whistle. Joe Gatenby continues to grow on me. Logging a ton of ice time, the 17 year-old defenceman competes and is getting better by the day. I thought Gatenby and Riley Stadel really stood tall after 20 year-old Cole Martin was a late scratch. Tyrell Goulbourne's short handed goal was fun to watch. The 20 year-old slowly took the puck through centre and it appeared he was simply going to dump the puck in and go for a line change. Instead, Goulbourne turned on the jets and skated through the Americans defense before backhanding the puck through the legs of goaltender Eric Comrie. That goal made it 4-1 and it was lights out for the home team. Nick Merkley earned an assist, extending his point streak to 12 games. The 17 year-old is now one point back of Chartier for the league lead in points. The Calgary Flames were well represented at the game with no less than three scouts on hand. The two I recognized were Brad McEwan and Rob Sumner. It was my first look at Americans 20 year-old forward Richard Nejezchleb. The New York Rangers forward had a quiet game. Honestly, I was expecting more. We didn't see him last season when he was with the Brandon Wheat Kings because he was preparing to attend the World Junior Hockey Championships in Sweden with the Czech Republic. The dude has size and is an offensive force - when he puts his mind too it. Rookie 16 year-old affiliate player Cole Lind earned his first career point on Tyson Baillie's third period goal. Lind is a 4th round bantam pick of the Rockets and is leading the Saskatoon Contacts in scoring and is third in league scoring in the SMMHL. The Rockets have now played 16 road games, tied for the league lead in the most road games played with Victoria and Kamloops. The good news is a four game home stand awaits, starting with a Saturday night tilt with the Regina Pats. Tonight’s Preview: It is the third of four meetings between the two teams this season. The Rockets are 1-1-0-0 after a 5-2 loss in Tri City October 18th before earning a 5-0 win October 30th. After tonight’s game the two teams conclude the seasonal series January 14th at Prospera Place. The Rockets are riding their longest losing streak of the season, two games, after 4-3 overtime loss last Friday to Portland and a 4-3 regulation loss Saturday night. This is the third straight game against a U.S Division team. Following this contest the Rockets open a four game home stand Saturday night against the Regina Pats. Let’s go streaking: Nick Merkley is riding an 11 game point streak (4+16=20) heading into tonight’s game. Here are the longest point streaks by a Rockets player over the years. Milestones: Tyson Baillie is 5 assists shy of 100 for his career…Nick Merkley and Kris Schmidli are 7 games shy of 100 for their careers…Riley Stadel is 10 games shy of 150 for his career…Madison Bowey is 7 assists shy of 100 for his career. Who’s Hot: Jesse Lees has points in 6 of his last 7 games. Lees has 4+7=11 over that period…Tyson Baillie has five goals in his last 6 games and has points in 7 of his last 9 games…Over that period, the 19 year-old has (7+6=13)...Rourke Chartier has two more goals (26) than he had all of last season. Chartier has goals in 12 of his last 14 games….Chartier has 25 points in November (15+10=25)…Nick Merkley has 4+15=19 in his last 11 games and is riding an 11 game point streak…Madison Bowey has been held off the score-sheet 6 times this season. League Leaders: Rourke Chartier and Nick Merkley leads the WHL in points with 45…Nick Merkley has 20 power play assists, the most in the WHL…Merkley leads the league in assists with 37…Rourke Chartier leads the WHL with 26 goals scored…Rourke Chartier leads the WHL with a +24 and is closely followed by teammate Cole Martin who is +23....Chartier leads the WHL in game winning goals with 7…Jackson Whistle leads the WHL in wins with 16. What did Kelowna Rockets head coach Dan Lambert have to say when asked if some fans across the WHL will be surprised that his team lost back-to-back games to the Portland Winterhawks on the weekend? "They are defending champs of the Western Conference", Lambert said dead panned on the AM 1150 post game show Saturday night. "I don't know how you can be underrated when...(pause)...you are the champ until somebody beats you. In my books, we were the underdogs in this series and they showed us why". I have received a number of compliments, and thankfully no complaints after my emotional call at the conclusion of the Rockets/Royals game Wednesday night. I went into 'Regan's Rant' mode and shared my opinion about what I saw on the ice when Victoria forward Brandon Magee went after Rockets forward Cole Linaker. I was careful not to go overboard, but if you read this blog regularly, I speak my mind and am not under the thumb of anyone to mind my p's and q's. I don't trade Kelowna Rockets team secrets, but that is because God gave me a brain to use and you don't cut off the hand that feeds you. What I hope to accomplish on this blog is some honesty about the way I feel, but I also want to be fair towards the opposition. I have spoken to Brandon Magee before and off the ice he is a good guy. He is personable. I don't hate him despite his stick work the other night that got me upset on the air. Will I talk to him again? You bet I will. I don't hold grudges unless you treat me a certain way. If you disrespect me, like one WHL coach who was recently fired did, I am done with you. If you portray that I am wasting your time during a pre-game interview, our interactions are over. You don't need me and I don't need you. An interesting discussion last week with a WHL executive on small crowds at WHL games so far this season. It was suggested the regression in fighting, while great in making steps towards eliminating concussions in hockey, is hurting the number of people who are sitting in the stands. The game is so "vanilla" and "predictable" said the executive. It is hard to argue with that. In the 80's/90's, you didn't know if a fight or line brawl would break out. Fans hated one another as much as the players did on the ice. You paid a ticket to watch the great goals but you also didn't mind dishing out your hard earned dough if you saw a great fight or two. The fact is players have friends on opposing teams and despite the statement that friendships are put aside when the puck drops it isn't the case anymore. The animosity or hatred between players is no where near what it used to be. It is a kinder, gentler game and some of the raw emotion is lost. 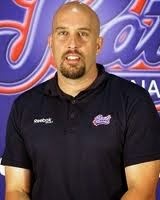 The best interview last week came from the Director of Officiating for the Western Hockey League Kevin Muench. I asked him several questions about officiating including embellishment. "I think embellishment is a concern at all levels of hockey. There is a difference about embellishment or going down soft. Sometimes a player will go down easily when he is hit. That is not embellishment. Embellishment is when you are trying to trick officials", Muench added. How about fighting? Are we headed towards a day when fighting is eliminated at the WHL level? "There was a time when there were multiple fights. There were times where there were staged fights. Do we see less fighting? Yes, I think so. Right now fighting has been minimized and I don't doubt it will continue that it will be gradually less", Muench added. Have you noticed that name bars on NHL, AHL, OHL and QMJHL referee's and linesman are absent? Did you also noticed every WHL official has his name tag (bar) on the back of his jersey? In the other league's fans have to yell out, "Hey 24, your a bum". In the WHL you can says his last name before throwing out a verbal barb. Have you noticed that fighting isn't the automatic reaction when a player throws a good body check on an opponent? I am not saying it doesn't happen, but it isn't happening as much this season in the games I've witnessed. "I think players have to feel comfortable that they don't have to fight if they don't want too", Kevin Muench told me. "The dangers now are as a result of a good hit they have to fight. We don't need younger players coming into our league who are tentative to throw body checks thinking that they may have to fight as a result". It is a crowded Kelowna Rockets crease with three goaltenders attempting to earn playing time. It is clearly the battle of the back ups with rookies Jake Morrissey fending off 18 year-old Michael Herringer. Herringer, who opened the season as a possible back up with the Victoria Royals, says all three, including starter Jackson Whistle are getting along famously. "I was part of three goalies in Victoria and Saskatoon so it doesn't bother me. 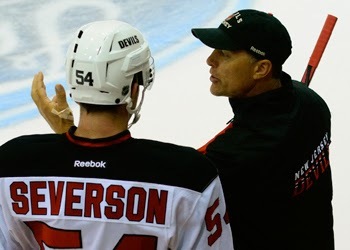 Your job is to stop the puck and help the team. We are all trying to do that. We are all on the same team so we have to be friends, right?" Remember at the start of the season when we were all concerned that Jackson Whistle may not be capable of being a starter in the WHL? Any doubts now? N-O! The Victoria Royals do a nice job of using interns who are responsible for doing many of the stats the team has in its game day packages. It is a nice use of that resource and I am sure they (interns) glean something from the experience too. The interns, I believe, are responsible for counting the shot totals of every player on the ice and they are featured prominently on the WHL website. I think the only other WHL team that counts shots per player, and then releases them period by period to the media, are the Calgary Hitmen. Those two organizations receive a high five from me. Remember a few weeks back it was suggested that a new rule should be put into place where 19 year-old players who had spent a minimum of three years in the CHL and are deemed too good to go back to junior hockey could play in the American Hockey League? If that were the case, Portland's Nic Petan and Oliver Bjorkstrand would no longer wear Winterhawks colours. Those two are heads and shoulders above the competition and are two of the best 19 year-old's you will find on the planet. Petan specifically passes like a pro. I haven't seen that skill level for years at the WHL level. Rourke Chartier has the most goals of any player in the CHL, yet he probably won't get an invite to the Canadian World Junior camp next month.Yes he is 18, but shouldn't the best players - regardless of age - with the hottest sticks get a look-see? I heard on an Edmonton radio station the other day where the hockey host couldn't believe that Damon Severson failed to make the Canadian World Junior team. Of the players invited to the World Junior main camp last year, six have spent time in the NHL this season with Severson being one of them. The others are Aaron Ekblad (Florida), Bo Horvat (Canucks), Jonathon Drouin (Tampa), Curtis Lazar (Senators) and Sam Reinhart (Buffalo). Am I the only one who thinks LinkedIn is useless? I signed up for it last year and haven't used it once. I ran into New Jersey Devils Director of Scouting David Conte at Saturday night's game at Prospera Place. I had to grab him for a couple of minutes for an interview where he spoke about former Rockets d-man Damon Severson. "He has been excellent. He is playing more minutes than anyone else". Conte likes his low panic threshold. "It is a strength and a weakness sometimes. Complacency at some points but I like everything about him. He is a modest individual. He is a team oriented guy. The sky is the limit. ", Conte added. The greatest adjustment for Severson is off the ice where he is a 20 year-old player who's teammates are significantly older than him with wives and kids. Look no further than 42 year-old Jaromir Jagr. I will have the entire David Conte interview Wednesday from Tri City. What does Conte think of Nick Merkley who is rated as an 'A' prospect by NHL Central Scouting? "Obviously through Damon I have seen him over the years. It is the first time I have seen him this year though. It is quite clear he is an impact level player and that was to be expected again. I equate it this way. A lot of times scouting is a lot like going into the 9th grade and saying, who is going to be the doctor? The ones that have the best grades, work the hardest and have the highest aptitude usually have the best chance but they have to do it from there. Nick is probably the guy that could be the doctor but he has to take the other courses too", Conte added. It looks like Dillon Dube is the closest to returning to the line up. The 16 year-old, who has played in just two games this season, could be back Saturday against visiting Regina. The Cochrane Alberta product broke a bone in his foot in practice and missed the first 8 games of the regular season and then was hurt in his second game back after a kneeing incident in Spokane on October 17th. Dube has missed 16 games since. I miss his smile and positive demeanor on the bus. Were you holding your breath when Nick Merkley and Nic Petan dropped the gloves Saturday night in an unexpected fight? I did, for both players. I didn't want either to hurt themselves with an unfortunate incident of either hurting a shoulder or having a finger broken. Fortunately, no one was hurt. I received a message this weekend from a WHL executive wondering why I didn't update my blog following a home ice loss to the Portland Winterhawks Friday night. In joking, the executive said he reads my blog with his morning coffee and failing to supply a posting the following morning was b.s. I chuckled and wrote back that I appreciate him spending a small portion of his day reading my b.s. ;). 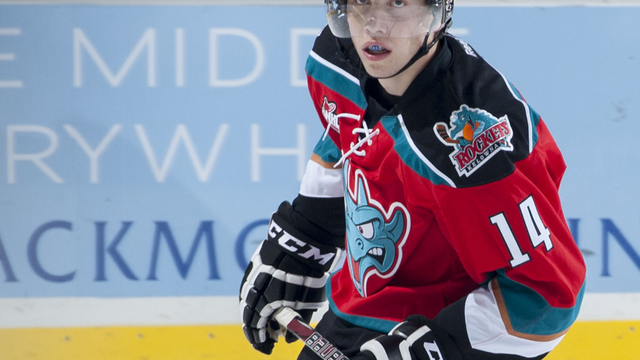 By the way, this blog is intended for Kelowna Rockets fans. It is linked on the teams official website. If you don't like it, or it leans too heavily towards the Rockets, don't read it. That's the intention. Dan Lambert didn't call it adversity after a pair of one goal losses against the Portland Winterhawks this weekend. The Kelowna Rockets head coach called it "a reality check". Can't argue with that. The Rockets, as good as their record may be, need to play a certain way in order to have success. Deviate off that template and the team finds itself riding a two game losing streak (0-1-1-0). Myles Koules scored game winner Saturday night in a 4-3 win for the Winterhawks, who also won the night before in overtime by the same score. The Rockets rallied with three-third period goals but came up short in their first regulation loss on home ice this season. A decent start for the Rockets in this one. In fact, if you compare it to Friday's game, it was a significantly better opening 20 minutes. The second period saw the Winterhawks score twice for a 3-0 lead. The killer goal to give up was a Dominic Turgeon centering attempt that went off Rockets rookie Tomas Soustal and into the back of the net. It was a gift goal for the visitors, who need no help in manufacturing offense. Whatever was said in the second intermission paid off as the Rockets had the most jump we've seen this weekend. They were hitting, playing significant minutes in the offensive zone and finding the back of the net three times. Rourke Chartier scored his league leading 25th and 26th goals of the season. The power play was the story of the weekend. The Winterhawks was deadly and the Rockets were below average. The Winterhawks were 4 for 11 with the extra man, or 50% of their 8 goals scored came with the extra man. The Rockets were 1 for 9, which means five of the six goals they scored were either even strength (4 of them) with one coming shorthanded. Why isn't Adin Hill the Winterhawks #1 goaltender? I would say five solid periods by the Calgary resident. Oliver Bjorkstrand was the best skater on the ice Saturday. Works hard. Battle levels is high. Always around pucks. The 19 year-old made a beautiful move to score his lone goal of the game by cutting around Riley Stadel before depositing the puck on the fore-hand past Rockets goaltender Jackson Whistle. The Rockets again played this game with 17 skaters, which was one under the league limit. The Winterhawks played the game without Paul Bitttner, who was hurt in Friday's opening game. Nice scrap between the Nic's! Nic Petan dropped the gloves with Nick Merkley. The good news? No one broke a hand. I counted two punches throw. One that missed from Merkley with a hay-maker right and a Petan punch when Merkley fell to the ice after the attempted knock out punch. The Kelowna Rockets coaches never make excuses after a loss. Never have, never will. 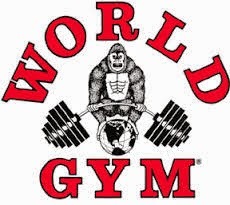 So with that said, let me do it for them. If the Rockets were going to run out of gas, which they did last night in a 4-3 overtime loss to the visiting Portland Winterhawks, it was bound to happen this weekend in an anticipated doubleheader been the two teams'. Unfortunately, it isn't a level playing field when you really look at what has happened over the last week and a half. The Rockets played 5 straight road games over 9 days and traveled a total of 2708 kilometers over that stretch. They traveled back and forth to Spokane, then made the long hike up to Prince George before immediately heading back south to Victoria for back-to-back games against the Royals on Tuesday and Wednesday night. The Rockets didn't travel back from Victoria until Thursday, arriving at Prospera Place at 2 pm that afternoon. Shaking away the cob webs, the players had to quickly prepare for a fired up Winterhawks team that is no weak sister despite what the haters will say. Making things worse is the injuries the Rockets have sustained over the last month. They were able to dress just 16 skaters Friday night, two under the league limit. Without Austin Glover, Dalton Yorke, Mitch Wheaton and Justin Kirkland and a suspension to Rodney Southam, like my hairline, the line up was awfully thin. Add up all those factors against a skilled team like Portland, are we really surprised the Rockets relinquished a 3-0 lead? For Winterhawks fans that think I am making excuses, remember when the Rockets beat your team 5-0 in the first game of the seasonal series? Were the Winterhawks not in Saskatoon on a Saturday and had bus troubles coming back home for a Friday night home date with the Rockets? The Portland players must have been tired and the 5-0 result was part in parcel of the fatigue the home team must have been feeling. Again, that game is another example of an unlevel playing field. "We got a point in a game we really had no business, so we can thank Jackson Whistle for that", head coach Dan Lambert told us on the post game show. Without a doubt Whistle was the reason why the game was as close as it was. It could have been a blow out. Whistle faced 52 shots, many of the high quality variety. If Whistle would have been mediocre, the score may have hit double digits. I thought a perfect example of how mentally tired the team looked was on the Winterhawks third goal. Watch it on video on the Rockets website if you don't believe me. Jackson Whistle stops the puck behind the net and promptly slides it, gingerly, towards defenceman Madison Bowey who can't handle it. It is turned over in the corner where Portland overager Myles Koules sends it into the high slot where Winterhawks leading scorer Chase De Leo is at high speed and fires a low shot past a startled Whistle. For me that goal was the back breaker. Bowey, who is world junior potential, is unable to handle a soft pass from Whistle, which showed me and the 55 hundred fans and a national TV audience exactly where the mental fatigue level was of the home team Friday night. The Rockets may have had a 3-0 lead, but they capitalizing on the few chances they had in the opening period. Portland came out hard, but the home team opened the scoring on its first shot on net. Winterhawks goaltender Brendan Burke was fighting the puck and was quickly replaced by Adin Hill to start the second. Hill had an easy night. Steady when called upon, the Calgary resident made just 14 saves the rest of the way. Oddly enough, the Rockets had a chance to win the game when the Winterhawks took a delay of game penalty with 2:06 left in the game. My fear, considering how the Rockets were playing and how hungry the Winterhawks looked, was surrendering a shorthanded goal. The best look the Rockets had on the power play was when leading goal getter Rourke Chartier missed the corner of the net on an in-tight chance. Nic Petan doesn't get a point, but he was one of the best players on the ice. Petan controls the play and often is seen stick handling with the puck like it is on a string. 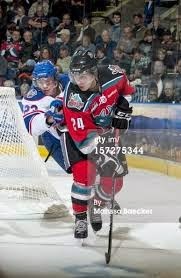 I think he is the best player in the WHL. I really do. Chase De Leo did so many things right last night. Take away his two goals and watch how hard he works in his own zone. A great skater, De Leo does not give up on plays. He tracked back hard throughout the game and appeared to care as much about his d-coverage as he did about finding good chances to score in the offensive zone. De Leo also received rave reviews for his interviewing skills after the game from the local media. Act like a pro...play like a pro. De Leo is that guy. This game was broadcasted on Rogers Sportnet for all to see. Nationally televised, meant the game took a whopping 2 hours and 52 minutes to play. Sportsnet, by all reports, did a terrific job and even brought in the heavy hitters of John Shorthouse and John Garrett to call the game. The Canucks duo did a solid job, which really shouldn't come as a surprise. I was especially impressed with Garrett, who is as personable as they come. Gord McGarva and I had a nice conversation with him prior to puck drop. As for Shorthouse, I thought it was admirable of him to inform us that the Winterhawks were making a goaltending change heading into the second period. He motioned to use of the change while Gord and I were doing the out-of-town scoreboard and were concentrating on other matters. Again, small gesture by Shorthouse but one that was appreciated and shouldn't be overlooked. What happens tonight in the rematch? Rodney Southam is back in the line up after serving a one game suspension so that gives the Rockets another body to work with. Is Justin Kirkland healthy enough to play tonight after being injured in Prince George? That would give the team 18 skaters. Who starts in goal? Whistle must have lost 10 pounds after his exploits last night. Talk to you on the radio at 6:30. Tonight’s Preview: It is a rematch of last season’s Western Conference championship series as the Kelowna Rockets host the Portland Winterhawks. This is the Winterhawks first game back at Prospera Place after winning two of three games in the WCF on the road. After the Rockets won game one 5-4, the Winterhawks would win game two (5-3) and game five (7-3). These two teams have met twice this season – in Portland – with the Rockets earning a 5-0 win (Oct 30th) before falling 3-2 in overtime (Nov 1st). These two teams meet again tomorrow night. The Rockets completed a five game road trip Wednesday in Victoria with a 5-3 win. The Rockets picked up 9 out of a possible 10 points on the trip, outscoring the opposition 24-15. Following these two games against the Winterhawks, the Rockets travel to Tri City to face the Americans this Wednesday. This is the teams 5th game in 8 nights. Overall, the Rockets have points in 13 straight games (11-0-2-0). The Big Three: Leading point producers Nick Merkley, Rourke Chartier and Tyson Baillie have combined for 114 points. Merkley, Chartier and Baillie have also combined to score 50 of the teams’ 118 goals this season. Merkley is rated as an ‘A’ prospect by NHL Central Scouting for this summer’s draft. Teammate Joe Gatenby and Tomas Soustal are ‘C’ prospect in the November rankings. Who’s Hot: Jesse Lees is riding a five game point streak. Lees has 3+7=10 over that period…Tyson Baillie has five goals in his last four games and is riding a four game point streak (5+5=10) ...Rourke Chartier has as many goals (24) as he did all of last season. Chartier has goals in 11 of his last 12 games….Nick Merkley has 4+12=16 in his last nine games and is riding a nine game point streak…Madison Bowey has been held off the score-sheet just five times this season (@Tri City/vs. SC/vs. Giants/@PG/@Vic). League Leaders: Nick Merkley leads the WHL in points with 42…Nick Merkley has 19 power play assists, the most in the WHL…Merkley leads the league in assists with 34…Rourke Chartier leads the WHL with 24 goals scored…Rourke Chartier leads the WHL with a +22...Chartier leads the WHL in game winning goals with 7…Jackson Whistle leads the WHL in wins with 16. This and That: The Rockets were officially inducted into the Central Okanagan Sports Hall of Fame during a ceremony Thursday morning. The 2004 Memorial Cup winning team was honored for winning major junior hockey’s top prize...Did you know the Rockets allowed just three goals in four games at the 2004 Memorial Cup? The Rockets won by scores of 1-0, 4-1, 2-1 and in the tournament final by a 2-1 score…Eight members of the 2004 M.C winning team played at least one game in the NHL….The Rockets are 17-1-0-0 in their last 18 regular season home games dating back to last season….Last season the Rockets beat the Winterhawks in both regular season games at Prospera Place by scores of 6-2 and 6-3….Rodney Southam has five fighting majors in 8 games with the Rockets this season. 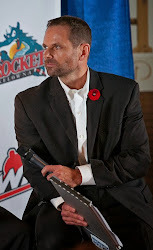 Southam has four tilts in his last five games…The Rockets have just completed a stretch of playing 11 of their last 16 games on the road….Tonight the Rockets are entering a portion of their schedule playing 6 of their next 7 games on home ice….The Rockets and the QMJHL’s Saint John Sea Dogs are the only teams’ in the CHL without a regulation loss on home ice this season. The Sea Dogs are 8-0-0-2…Austin Glover has missed 5 straight games with an injury….Tuesday’s overtime loss in Victoria was the first time the Rockets have suffered a setback after leading after 40 minutes…The Rockets have the most points in the CHL (44) and have scored the most goals (118)….The Rockets have been held to three goals or less only four times this season…. The Rockets have scored 5 or more goals on the road in 10 of their 15 road games this season. Last year they score 5 or more goals 15 times on opposition ice….Nick Merkley hit the 100 point plateau with an empty net goal Wednesday night in Victoria…Merkley has 13 multiple point games…The Rockets are rated as the best team according to this week’s CHL Top10 junior rankings….Rourke Chartier tied the longest goal scoring streak in Kelowna Rockets franchise history. With goals in ten straight games, Chartier tied Jesse Schultz, who originally set the mark in the 2002-2003 season.…Rourke Chartier had his 13 game point streak on the road snapped Tuesday night in Victoria. The 18 year-old has 18 of his 24 goals on opposition ice….Chartier has been held off the score-sheet four times this season…The Rockets are an incredible 131-28-5-5 in their last 169 regular season games dating back to the start of the 2012-2013 season….In case you are wondering, the Rockets have not been shutout in 101 consecutive games. 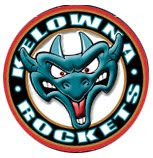 The last time the Rockets were held without a goal was March 3, 2013 in a 3-0 loss in Kamloops…Tyrell Goulbourne hit the 400 penalty minute mark in his career with a fight against Victoria’s Taylor Crunk Wednesday night. Goulbourne has 6 goals in his last 6 games. Jamie Benn, you've got company!